The university of Baghdad reaffirms its lead in world classifications by gaining three stars in QS rankings of quality. 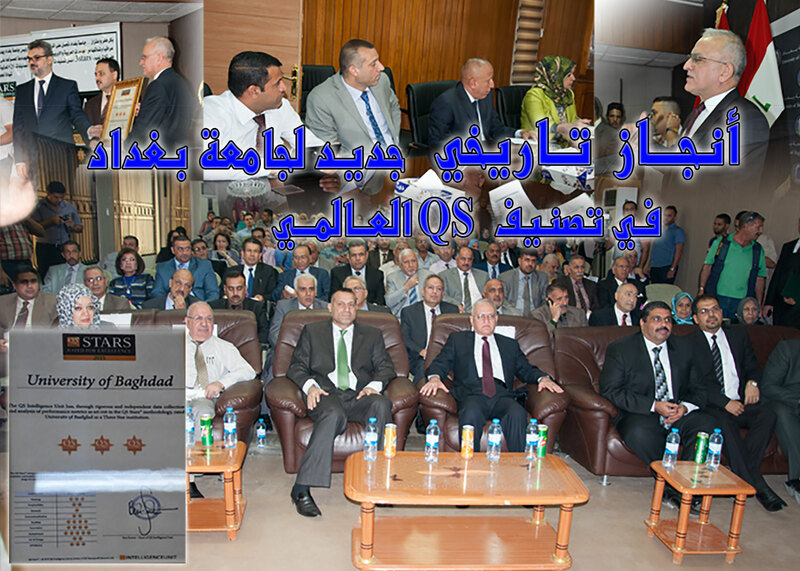 This came through a ceremony held in the presence of the president of the university of Baghdad, Dr. Alaa Abdul Hussein Abdul Rasul, his assistants, deans of faculties and directors of departments at the university formations. The university announced this event in an official declaration where the teacher “Samer Mubarak” and “Dr. Marwan Abdul Hamid” gave a brief and a detailed explanation on this ranking for gaing three stars out of five for quality and this certificate is the highest one in the field of quality of higher education achieved by the university during its career spanning over more than 50 years. The university president, Dr. Alaa Abdul Hussein Abdul Rasool praised this achievement that came as a result of the work of a specialist group for more than 18 months of hard work and cooperation with international experts and appraisers in (QS), note that this rank came after analysis and evaluation of (50) indicators classified into eight main areas. This rank is the top level in Iraq, where the universities of Babylon and Kufa won two stars in quality, so that university of Baghdad was similar with many British and European universities and university of Jordan in this regard. Also the university won five stars in (inclusiveness) which is the highest rank, and four stars in (facilities and innovation). Non-traditional facilities are provided for university students that represent, in other words, the learning environment which includes sports, residential aspects for students, library, medical and technical services. The strategic plans under implementation strive for attaining universalism and the work is ongoing to achieve this aim in the right direction. 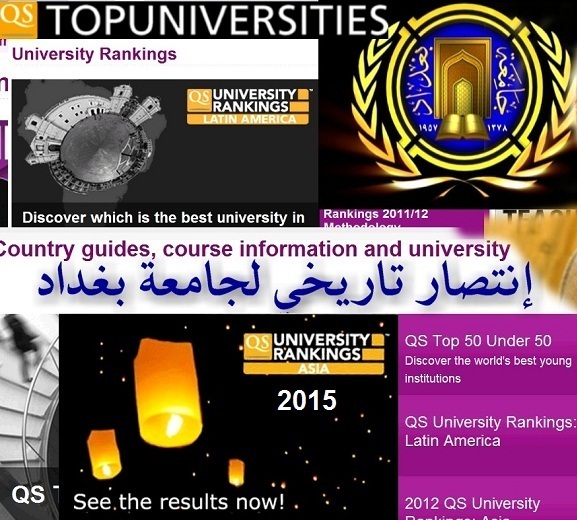 After the considerable achievements of our mother university by entering the world Guinness encyclopedia, gaining the first rank in “Webometrics”, being among the top (18) Arab universities and recently gaining three stars in “QS” ranking as the first and the best Iraqi university by getting the (156) in “QS” for the academic year (2015-2016), the presidency of the university of Baghdad exerts strenuous efforts and very careful and continuous monitoring to be in line with other international universities worldwide. This achievement is part of a series of achievements made by the university in this respect on the basis of work plans and improvements for the university. This is considered as an important achievement for the reputation of higher education in Iraq in general and Baghdad university in particular. It is worth mentioning that Baghdad university is the only university in Iraq that entered this ranking since 2011 thus has made a qualitative leap in progress compared with previous years, being in the (198) rank among (3539) universities worldwide, so that it made a growth percentage (13%) over the last year and (59%) when compared with 2011 which is the best height achieved in the Arabic region and the world. Ten British universities and (22) American universities besides other European an Australian universities got similar rankings (+ 107). Baghdad university excelled a number of Egyptian universities such (Ain Shams, Alexandria and Al-Azhar universities) that retained the same status (+ 107). The university has obtained this status because of its superiority in the ratio of its professors to students ans its academic reputation, seeking to maintain other criteria, such as the number of papers published in international sober journals and improving the reputation of its graduates, the teaching process and learning outcomes, relying on their opinions in the preparation of curricula and academic programs. The president of Baghdad university, Dr. Alaa Abdul Hussein blessed this achievement and praised these valuable efforts also the university received several congratulations and blessings on this occasion. Every year the university celebrates the graduation of engineers, doctors, managers, technicians, philosophers, pharmacists and others in a majestic festival attended by dignitaries at home including the minister of higher education and scientific research, a representative of the president of the republic in such a scientific event that rejoices all people without exception, thus the university forms a crucible for all people. University of Baghdad, each year, graduates a constellation of scholars and intellectuals who would build the life of the nation in all fields to make use of them in the labor market according to a gorgeous humanitarian perspective. 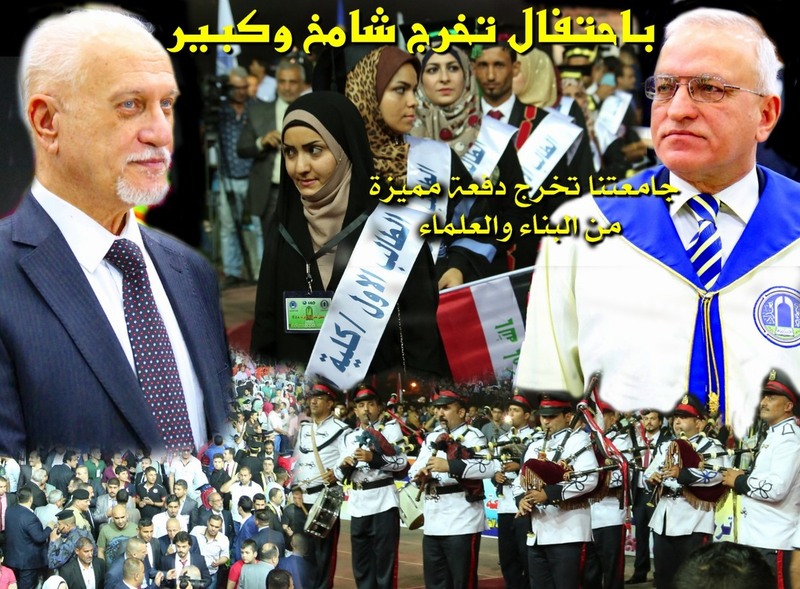 This is the largest live celebration of its kind in the Arab world and Middle East attended by the minister Dr. Hussein al-Shahristani and political figures, filled with joy and delight where Dr. Alaa Abdul Hussein, president of Baghdad university stated in an interview with the university channel that our university faced the unenlightened and destructive thought and won the struggle with book and the pen to draws a gorgeous picture of life. Dr. Hussain al-Shahristani, confirmed in an interview with the university channel, that the university of Baghdad is always distinct, especially this year in spite of suffering from weak financial disciplines and the violence that Iraq encountered recently Daash, but it continued its scientific approach and today it dedicates the success of this group of its graduates to the heroes of the popular crowd who exhibits the most beautiful and finest pictures of construction and defense of their homeland and that the educational process at universities will not be interrupted, God willing, through the efforts of those concerned for the benefit of our beloved country, also his excellency praised all sincere efforts to achieve this successful festival. Many scientific institutions and organizations have participated in this event, headed by the ministry of higher education and scientific research where Dr. Hussain al-Shahristani distributed gifts and awards to top students who represent more than 43% of the graduates in Iraq. Prof. Dr. Alaa abdul Hussein, the rector, prof. Dr. Riyad Khalil, the administrative assistant of rector and prof. Osama Fadhil, the scientific assistant of rector supervised the preparations for this graduation celebration under the motto (by science and work, hope is achieved), it is worth mentioned that this is the 75th graduation ceremony held in the faculty of physical education in Jadriya, where the work expanded late with the blessed efforts of director of the university website, Basim Hamid, who kept abreast with the website team of all the preparations for this majestic event for documenting and displaying it in a beautiful image in line with the glamor of this ancient university. Prof. Dr. Alaa Abdul Hussein, the rector has conducted several day and night inspection visits to the stadium of the faculty of physical education, accompanied with his assistants, a number of directors of university departments and deans, keeping abreast of the presentation platforms, mega video screens, amplifiers and the platform timing to ensure workflow at the best levels. Iraqi dispatched students excelled in U.S universities. Minister of higher education and scientific research visits operations troops.